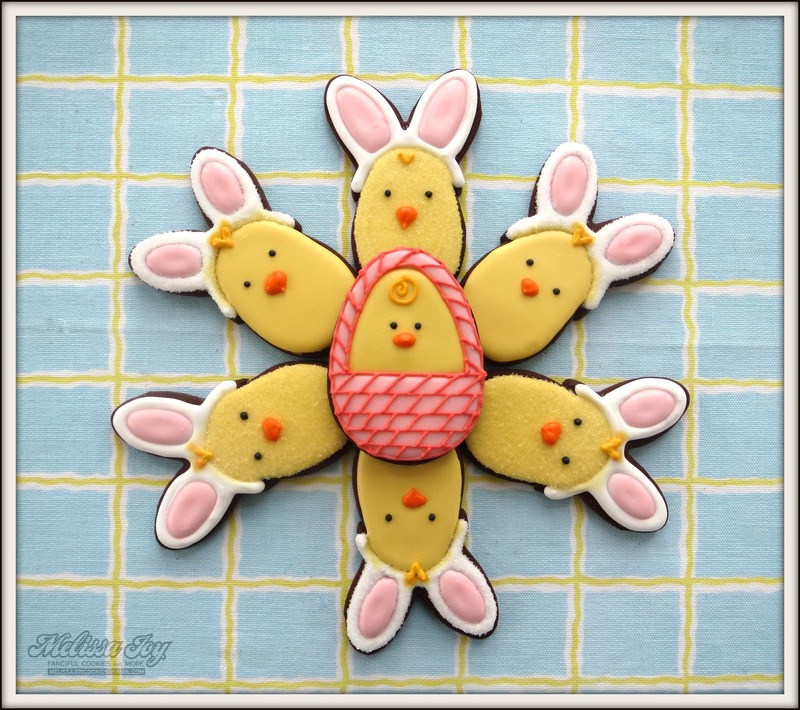 I finally got the cookie mojo back last week and began some Easter holiday goodies! Of course I am quickly running out of time to get them all done, but I will do my best to accomplish as many as possible. I do not own a KopyKake (yet! ), so my lettering always lacks the perfection and fonts I desire. I just practice a few times on wax paper, then hold my breath and hope for the best when I start on the cookie. I usually make extras in case they turn out truly horrible, but for this design I only had enough dough for one chance! The old Cadbury Egg commercial (“Thank you Easter Bunny! BAWK BAWK!”) gave me the idea for something like this. I used the bunny face cutter for the ear “headband” and a small egg cutter for the chick. Once the pieces are cut out of the dough, fit the two together like a puzzle, bake and ta-da! Kinda cute! This is my Busby Berkeley inspired cookie shot. The little basket chick was a design from last year and I still love it. I’m always nervous about shipping cookies with appendages, like bunny ears, so I try to come up with shapes that will hold up better. Can’t go wrong with an egg then! I made these with an Easter buffet in mind. I find it gets a bit crazy when I try and create too many different styles at one sitting. By the time I got around to these carrots, I was done. I know they could still use a little something. Next season perhaps! Have you started your holiday preparations for the upcoming weekend? 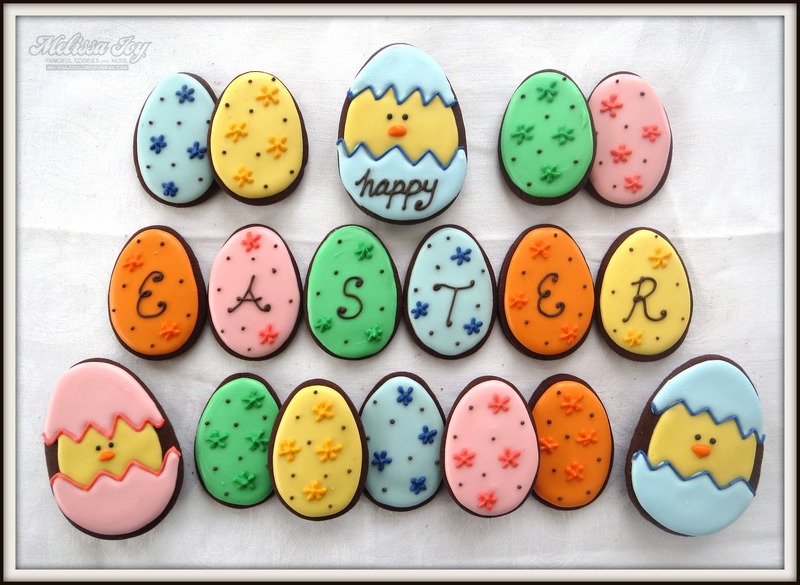 This Bunny has a bunch of shopping to do, but not before I get in a little more baking. I attempted painting on a few cookies that I will post next time. Definitely nothing fancy! I just wanted to give it a whirl to change things up a bit. I still want to try painting gingam patterns on some eggs that I didn’t get to with this batch. 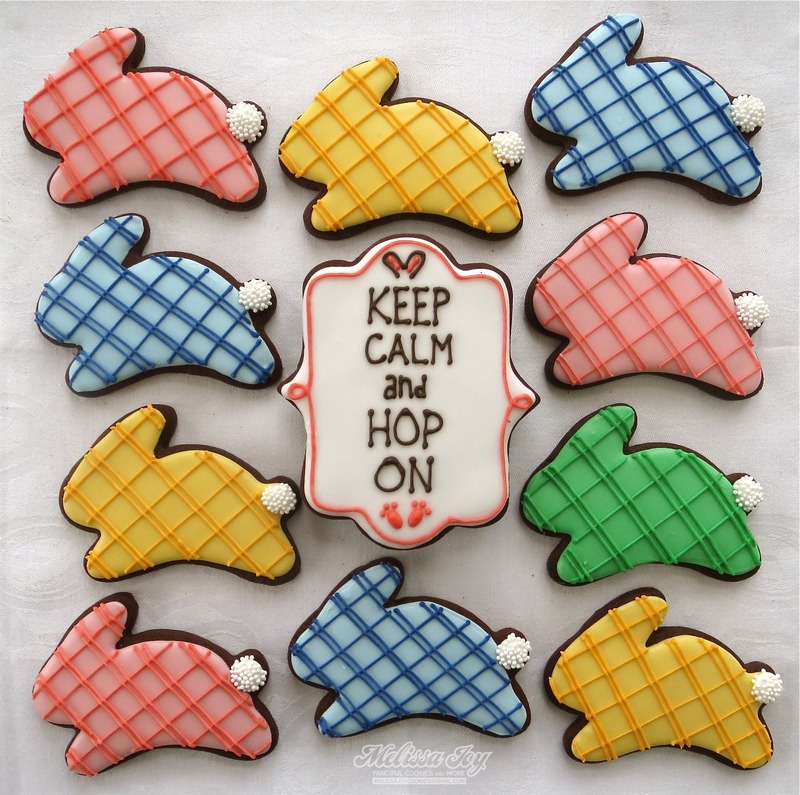 Better hop to it and get the dough started! Too predictable of a pun? 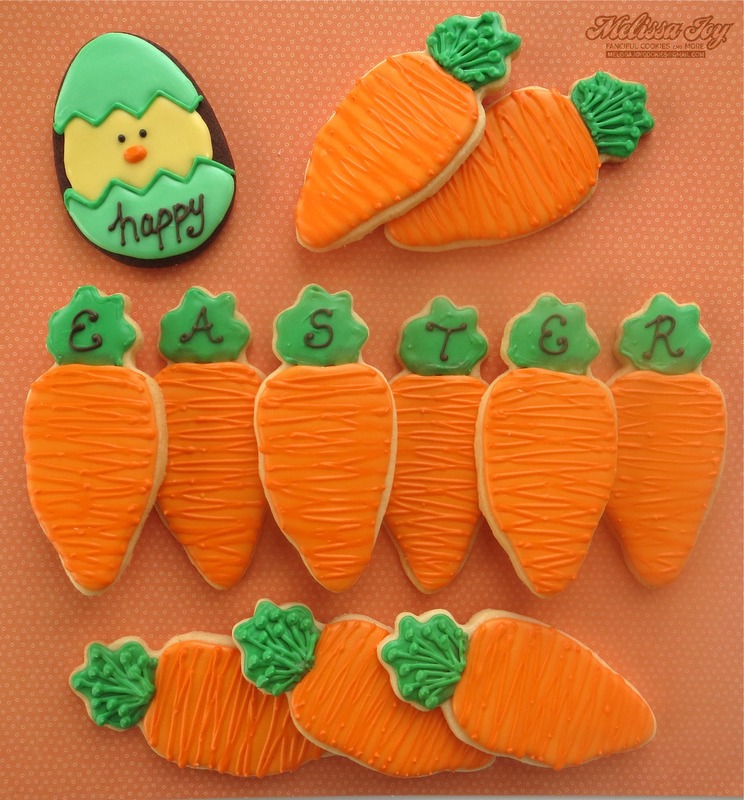 This entry was posted in Easter Cookies, For Fun Cookies, Spring Cookies and tagged bunny cookies, carrot cookies, easter baskets, easter buffet, easter cookies, egg cookies, holiday goodies, Keep Calm. Bookmark the permalink. ← Giving thanks to the present, past and future. I love all of these!! 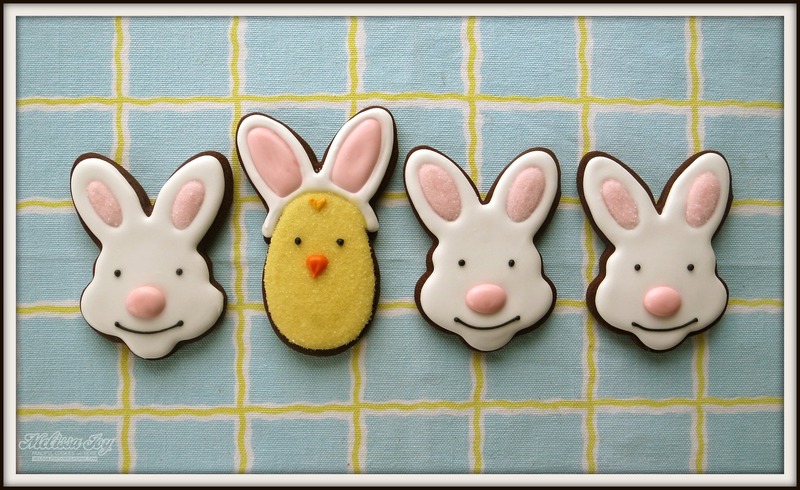 The bunny face cookies with the big pink nose are just adorable! Also, your pattern sans KK looks great! I love seeing designs that don’t use a KK as I don’t have one 🙂 Tx gal! All I’ve got to share at the moment are designs from last year. I’ve had so much going on in “real life”, that the cookie life has taken a back seat. Better get on it, or Easter will be here before you know it! Thanks for the cookie love!